For individual typists and for groups from 1 till 40 persons 3 days. It’s known that everyone wants some wonder on new place, and we’ll do our best you to get that. — Where? – Here, in Kyiv. Indeed, Kyiv is beautiful one. Brightly decorated with greenery, old Kyiv recreates true festive atmosphere, where we always are aspire to. Meeting. Bus and walking city tour “Kyiv is eternal city”. Car and walking city tour. 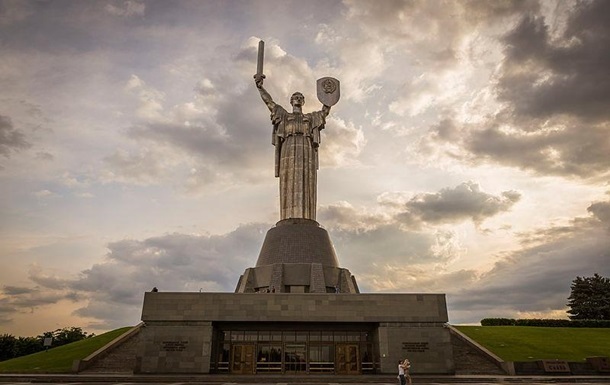 You will begin your journey from the Golden Gates – grand entrance to Kyiv. The doors were decorated with luxurious stones and sparkled, that is why the gate had such name. Here a statue of price Yaroslav the Wise stands. He was a grate town-planner and, above all, wise and enlightened man. 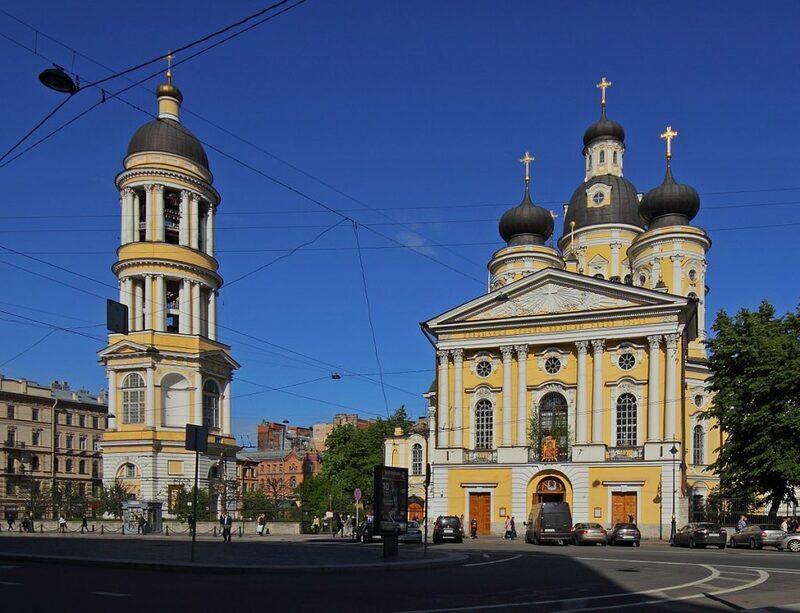 You will observe St. Sophia Cathedral, a monument of 11 century. Frescoes and inlays of those times have remained there; but above all, here is Kyiv’s keeper, its solicitous Berehunya – Oranta. However, that is an age-old legend you could touch to only having come to Kyiv. 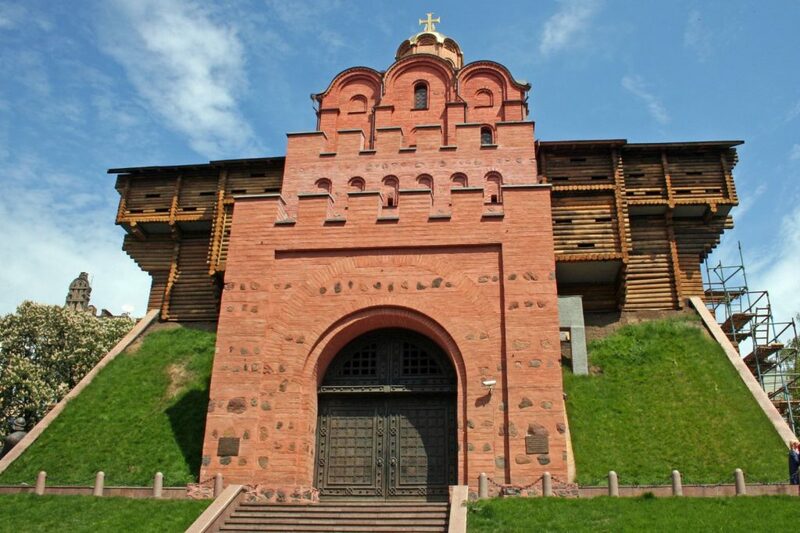 Then, You`ll see the ancient Pechersk, place of solitude, where monks have settled since olden times. Monks founded the main orthodox sacred place – Pechersk Lavra (Cave monastery). After that we`ll visit President bilding, Verhovna Rada of Ukraine (the Parlament) and the Cabinet of Ministers. Free time. We recommend visiting Water-info centre, visit to Museum of Toys, Drugstore Museum, Hetman Museum, Chornobyl Museum. Optional: dinner with folklore program (50 EUR per pers., 10-15 persons – advance order). Breakfast. Walking tour. Kyiv-Pechersk Lavra – that’s a monastery endowed with peculiar, unique energy! 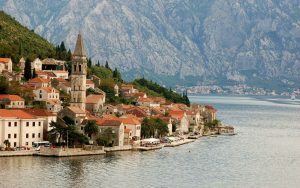 This is the oldest pilgrimage centre of orthodox Christians from Eastern Europe. Relicts of Saints, those whom the Gord’s will made imperishable, lie there. At will – visiting the caves. Visit to Architecture and Everyday Life Museum In Open Air “Pyrohovo”. That is an architecture and landscape complex where 300 monuments of architecture from all over Ukraine are concentrated. Home atmosphere prevails is here, and always, even when inclement weather, it is cosily and festive here. Optional: Visiting of theatrical performance “Golden Scythia” (for minimum 15 persons; 20 EUR/pers. ; advance order). Breakfast. 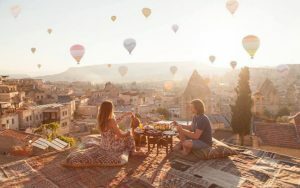 We recommend away excursion of your choice! 1. Visiting Museum of Trypillian Culture – the most ancient civilization arrata (favorite museum of Ukrainian president Viktor Uschenko).The cult of Mother-progenitrix, the Yin-Yang symbol, our painted krashanky and some other are originated in this ancient culture. After the visit to Trypillian land, many of the Ukrainians’ traditions become clear. 2. Visit to the ostrich farm with ostrich meat course tasting. Optional: walking tour “Andrew’s descent and visit to “M. Bulghakov’s Museum” (group of 10 persons – 10 EUR). Andrew’s descent is the most kyivian of all Kyiv’s streets. 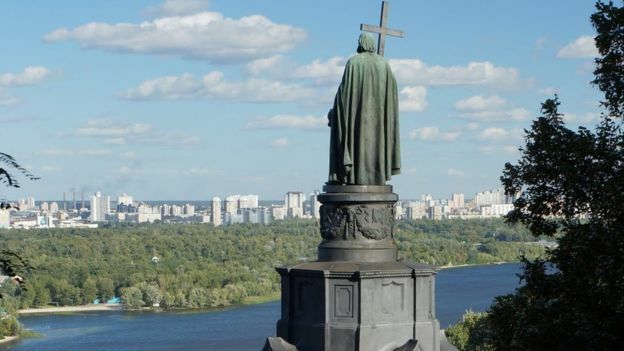 Here is the oldest place in Kyiv – “from here began Russia”. That is the hill, where Kyi, his brothers Zek and Horiv and sister Lybid founded Kyiv. 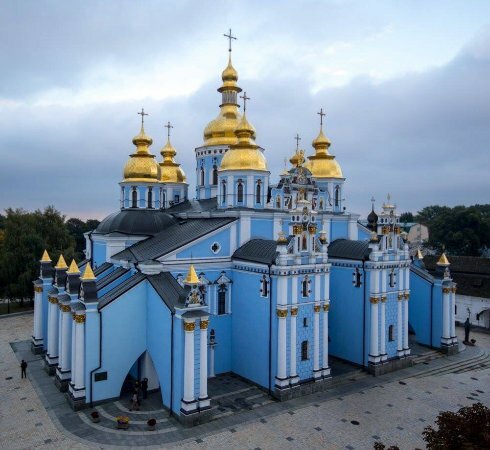 Uzviz, that in Ukrainian means descent, begins with St. Andrew’s Church – the most poetic church of the city. 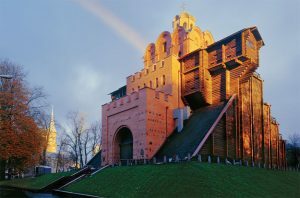 It was erected by the courtier architect – Italian Bartolomeo Rastrelli – according the will of Empress Elizaveta Petrovna, daughter of Russian tsar Peter the Great. Andrew’s descent is the place, where youto go to bay souvenirs for your dear relatives, but do not hurry up! Just look around, look closely, define what is very yours… And buy it! Four museums are situated on Andrew’s descent. 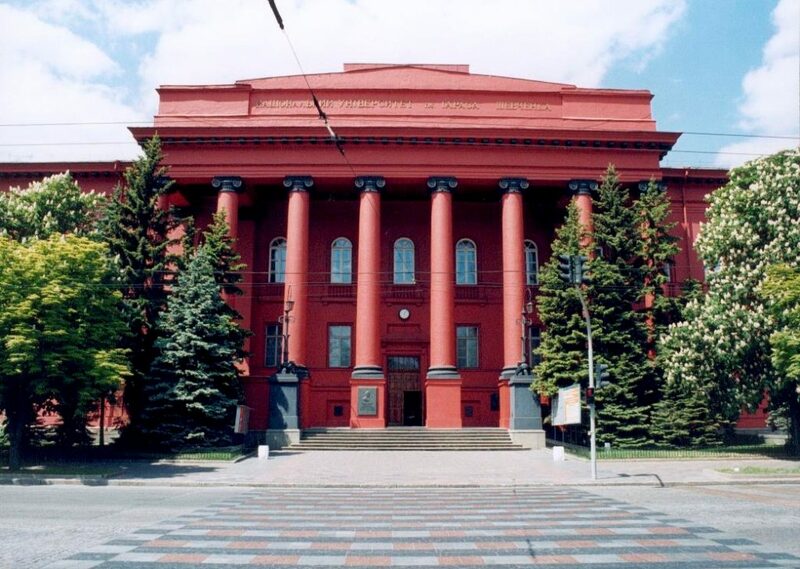 The most famous among them is Bulghakov’s Museum. Two families: the real – Bulghakovs, and Tyrbiny — fictitious, literary heroes of the novel “White Guard”, lived and live there. One street Museum is also very interesting. It tells about the history of the Uzviz itself and wonderful people once lived there. By the way, this museum won the international contest “The best European museum of the year” in 2002; it is suggested visiting by the world-famous guide “Let’s go”. Transport service: according to the program, transfer: railway station-hotel 1 day. Transfer to railway station – 60 EUR for group of 10-16 pers. The program is promotional and could be changed at tourists’ will. Shift of program components without the change of its capacity and substitution for excursions by the equal are possible. Bus service in free time is not provided or provided for extra payment.